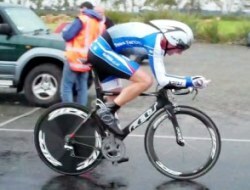 26/03/2011 - The Southland Road Championships began today with the Time Trial Champs held on the Waianawa Circuit. Persistent rain made for trying conditions as Southland titles were handed out across 13 different age group categories. The early junior races saw comfortable wins for Maddy Gough, Lachlan and Bronwyn Graham and Liam Haggerty, who transfered his strong track form onto a blistering ride on the road. The Under 17 Girls saw one of the closest battles of the day, Jen Muhl shading Georgia Vessey by just 11 seconds, while Josh Haggerty took his younger brother's lead to dominate his fellow Under 17 riders. Sarah Tomlinson was crowned Under 19 Women's champion while there were three clear cut Masters winners - Erin Criglington (Women), Ray Robinson (45+) and Derek Tan (35-44). Tan's time was particularly impressive, being the fastest recorded for three laps for the whole day. Kylie Young took the Senior Women win while Mat Zenovich took out the Under 19 Men's title with Tom Vessey, Jamie Culling and Paddy Daly fighting it out for the other podium spots. The Senior Men's race was controlled from start to finish by Simon Croom, who finished nearly a minute ahead of his closest rival. Dillon Bennett ripped home to make up nearly 30 seconds on his final lap to claim silver over Brehan Cairns in third. Tomorrow's road races start from 10.00am in Wyndham and will feature strong fields, particularly in the Senior, Under 19 and Masters men. For Road Race details click here. For race report and results from Sunday's Road Race Championships click here.